We had an awesome tour of the <?xml:namespace prefix = st1 ns = "urn:schemas-microsoft-com:office:smarttags" /> Nile and ancient Egypt. I’ve wanted to visit this country ever since I read “Asterix and Cleopatra” when I was 10. It has totally lived up to my expectations. Egypt lives and breathes thanks to the Nile River. 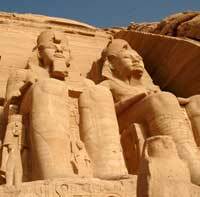 Before the Aswan dam was built the Nile flooded seasonally, regularly refertilizing the soil on its banks. This rich soil means that 95 percent of the population of Egypt lives on 5 percent of the country’s total land. 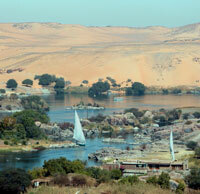 One side effect of the Aswan dam project was the creation of new lakes on top of ancient monuments. In order to save the best ones, the powers that be cut up and moved 110 of them to new sites. It is hard to express the hugeness of a project like that in words. Imagine: They cut up the Temple of Philae into 40,000 numbered pieces, then transported and reassembled them on a completely different site….40,000 pieces, and you can’t even see the cut lines….they are seamless. The Nile River cruise was fantastic. 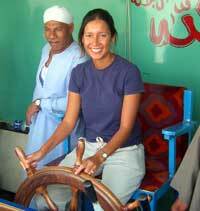 I highly recommend it to anyone interested in touring Egypt. There are a ton of boats to choose from, most of which have really nice accommodations. Our tour package included three days and four nights on board, with buffet-style meals three times a day. Definitely a change from our normal cruising diet. It was nice not to be responsible for moving the boat, too. Our second to last night on the riverboat was an “Egyptian Dress” themed dinner. All week we had been prepped for this meal by the storeowners on board, who were hoping to sell us galabiyahs (Egyptian style robes) for the event. In an effort to save money I cut and folded a cardboard box into a giant helmet of Anubis, the jackal-headed Egyptian god. Threw a white towel around my waist, and voila. The guys at the store did not think it was funny, but the kitchen staff did. Many of you have probably heard the word “baksheesh” before. It basically means “bribe”, usually in an under-the-table-but-necessary-for-progress way. It’s the type of word that gets thrown around by travelers like Uncle Benji when he talks about his lucrative business smuggling poodles past border guards in Lebanon. 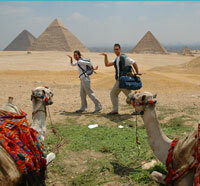 Egypt is the land of baksheesh…and here, the real meaning of the word is “gift”. 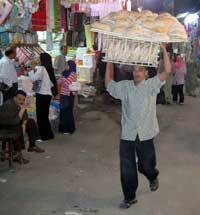 A large part of Egypt’s economy revolves around baksheesh. For an Egyptian it may mean a small payment for facilitating an official service (like getting a driver’s license without waiting five years for the forms to process). For the western tourist, it means being expected to tip almost everyone you come into contact with. It was hard to understand at first, since in American culture we usually tip only when some extra service is performed for us (carrying bags to hotel room, great restaurant service, etc.). In a tourist economy fueled by baksheesh, tourists are expected to tip freely (carrying bags to hotel front desk from bus after wrestling you in the parking lot for each bag, carrying bags to hotel room from front desk after wrestling again and kicking you in the shin to obtain said bag, driving the bus, stopping the bus, allowing you to take a picture of them, them taking a picture of you with your camera, holding up a goat that you can take a picture of, pointing out a hieroglyphic on the wall, etc.). Probably the funniest incident was when mom tried unsuccessfully to open her hotel room door in Cairo. She had one failed attempt (the key was upside down, so she flipped it over) when a hotel guy appeared out of nowhere (unasked), grabbed the key out of her hand (unasked) opened the door (unasked) and wouldn’t give back the key unless she gave him money…..which proved to be a miscalculation on his part because mom isn’t easily intimidated. When the guy glanced down the hallway, mom grabbed the key out of his hand and slammed the door. 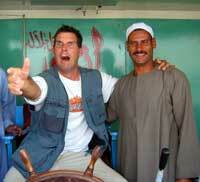 I have been looking forward to filming Egypt. 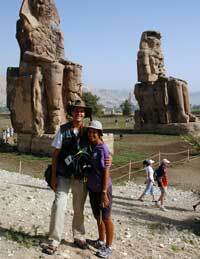 Ancient temples, statues, and pyramids all make for exciting footage. By and large we didn’t have too many problems. I got pressured a couple of times by guards who thought our video camera looked professional and wanted 200 dollars before they let me take it in. The first time was at the Temple of Karnak in Luxor…no big deal, just a bit of yelling back and forth for five minutes to make it clear we wouldn’t be intimidated. 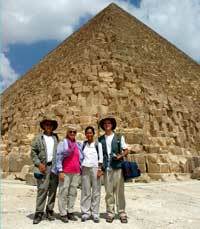 The second time was at the pyramids of Giza in Cairo. The gate guards there were extremely aggressive (one in particular – I shall call him Blue Doodoo Head because he wore a blue sweat-stained shirt…I didn’t like him, but I am going to be mature about it). In the end we refused to pay the extra fee (200 bucks! Are you kidding?) and stomped over to the Sphinx. Blue Doodoo Head sent an underling to follow us around and make sure we didn’t film. He stuck around for 45 minutes then kind of drifted away, but not before making sure I couldn’t get any footage of the Sphinx. No worries. I hope it doesn’t sound like I’m complaining. I had a great time on tour. It just seems like telling you about the side adventures adds a little spice to the narrative. Sarah’s Journal is a great place to check out the day to day sights and experiences. The ancient Egyptians didn't do anything on a small scale. 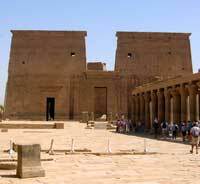 It's incredible that 5000 years later we can still walk through their buildings, tombs, and temples. They had such an interesting and elaborate conception of the afterlife...from their point of view, this world was just a rehearsal for death. Many people labored their whole lives in order to pay an artist to create a statue of them so they would be assured an afterlife. 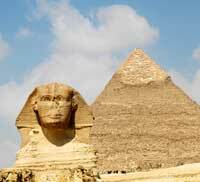 In fact, the whole reason behind tombs, pyramids, and embalming was so the person would have a good afterlife. For example, if a nobleman wanted to eat fish in the afterlife, he would make sure to have heiroglyphics of servants building a boat and fishing from it carved on the walls of his tomb. Kings and queens filled their tombs with their favorite chariots, riches, and other possessions so they could use them after death. Speaking of mortality, I took some kite surfing lessons when I got back to the boat. It is bit of an expensive sport, but one well worth pursuing if you have health insurance. I haven’t tried kite surfing since I lived in Florida, where a super nice friend let me use his gear to learn the basics (unfortunately there were sea urchins in the area, so I ended the day with 14 spines in my feet…and I didn’t have health insurance at the time, alas). For those of you who don’t know, kite surfing is like wakeboarding, but instead of a speedboat you use an enormous kite to pull you across the water. The strength of a kite’s pull brings thoughts like “V8 engine” and “Angry Tyrannosaurus” to mind. The main difference between a sport like windsurfing and kite surfing is that you can’t stop by just letting go. The kite is attached rather firmly to a harness, which is attached even more firmly to your body, which means you and the kite are one. It’s very zen, in a terrifying, life-threatening way. The really good kiters can do mind-blowing jumps of 30 or 40 feet into the air. It’s hard to believe unless you see it. Actually, come to think of it the really bad kiters do mind-blowing jumps too, but usually theirs involve screaming. Dad and I watched a guy go out with far too large of a kite (simple physics: bigger kite = more power = higher jumps = deathwish) whereupon he was soon pulled into the air three times in succession. Each flight was 30 feet long and 15 feet high, and involved stretching out like superman while in the air. By his third crash landing he finally hit the emergency release on his lines (which he should have done ages ago) and lay in a crumpled heap for other people to carry him out of the water….which, by the way, was about six inches deep. Off he went to the hospital and off I went to my lessons. I was pretty conservative about my kite sizes after that. 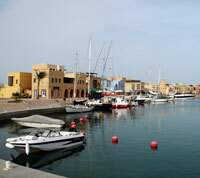 The beach by our marina is the premier kite surfing destination in the Red Sea. Every week new German, French, and Russian tourists flock to Mangroovy Beach to learn how to cruise the friendly skies. Sometimes it gets a little crowded (and shallow), but most of the time it is a great place to learn. I’ve been trying to get Dad to learn, but I think his survival instinct may be too strong. no matter what VH-1 says. An awesome picture of Sarah. An unfortunate picture of the camel owner. on her head and being irresistibly cute.